The visualization above shows the magnetic field around Earth, the magnetosphere, as it might look from space. The iron-cored Earth behaves like a great magnet, generating a huge magnetic field around the planet that protects it from blasts and harmful radiation from the sun. 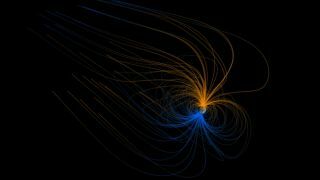 The recently released NASA visualization above shows this field, called the magnetosphere, as it might look from space. This view is conceptual, but based on real science observations that have been made since the beginning of the Space Age. The orange and blue lines depict the opposite north and south polarity of Earth's field lines. The field lines of the magnetosphere are not actually visible to humans, but they can be detected by sensors that count atomic particles — charged protons and electrons moving in the space around Earth. The magnetosphere bulges on one side and tapers off on the other because it is pushed in on the side facing the sun by the solar wind and stretched out in the Earth's shadow. The solar wind is a stream of high-speed particles flowing out from the sun and carrying the signature of its own magnetic field. Like the ozone layer, the magnetosphere is important to life on Earth because it protects us from most of the harmful radiation and hot plasma from the sun, deflecting it into space. The interaction of solar flares and other emissions from the sun with the magnetic field can disrupt radio transmissions and damage satellites in a phenomenon known as space weather. They can also produce beautiful auroras. This story was provided by OurAmazingPlanet, a sister site of SPACE.com.